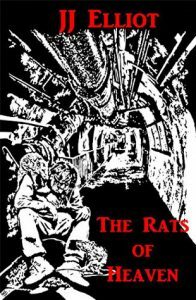 Okay, how about a furry story from a horror comic based on a tabletop game? You got it! Oni Press brings us Dead of Winter: Good Good Dog. “From the tabletop smash hit comes this new comic series starring your favorite characters from Plaid Hat Games’ Dead of Winter, written by Kyle Starks (the Eisner Award-nominated Sexcastle), and illustrated by Gabo (The Life After). In the pantheon of superheroes, none are more loveable and loyal than everyone’s favorite good ol’ dog, Sparky. 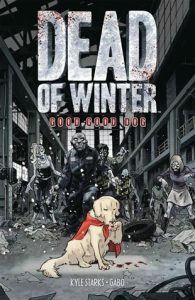 Surviving in the wintery apocalypse of the undead, this former TV show stunt dog turned zombie killing machine just wants to make friends and be a good boy. 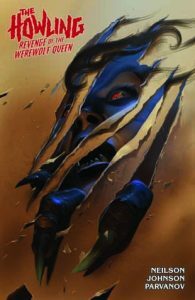 As his fellow survivors scavenge for supplies in the frigid wasteland, will Sparky be able to protect his companions from threats both undead and otherwise?” Check out this new trade paperback at DCB Service. 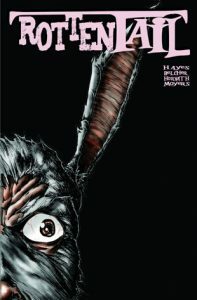 We found this in a recent Previews magalog: Stabbity Bunny, written by Richard Rivera, illustrated by Dwayne Biddix, and published by Scout Comics. “Seven-year-old Grace, still clutching her adorable plush bunny, is kidnapped by supernatural forces that have been hunting her family for generations. She awakens in a shack on the outskirts of town, and for the first time in her life, the little girl can’t sense her mother’s presence. Her captor knows the family’s secrets, and that link has been severed. When her escape attempt fails, it seems there will be deadly consequences, but an unlikely protector intervenes. 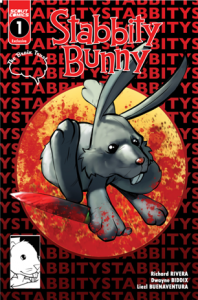 It’s a big mistake to kidnap a child with a plush toy named Stabbity Bunny!” Oh you just know someone is working on a movie adaptation of this, don’t you? We can see how the pitch for this probably went: “HE is a hard-boiled New England cop… IT is a Cthullu-spawned horror… Together, they fight crime!” Actually, here’s what we got from Previews: “Artie Buckle is a grade ‘A’ schmuck. His excessive fondness for booze compliments his flash temper, but hold their feet to the fire, his fellow officers would agree: Artie is one helluva cop. He’s gonna need that scrap of goodwill because Brick City is under siege from its citizenry… and to top it off Artie’s been saddled with the city’s newest hero as his partner: A hideous, monstrous, but completely likable, extra-dimensional being named Vinegar Teeth. 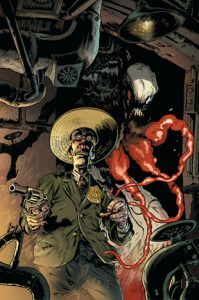 Can Artie pull his head out long enough to work together with a Lovecraftian monster with a heart of gold and set Brick City back on its feet?” Vinegar Teeth is a new 4-issue comic miniseries created by Damon Gentry and Troy Nixey. The first issue is out now from Dark Horse. Huevocartoon is an animation studio from Mexico that made a name for itself with the Huevos series of animated films — which were quite profitable north and south of the border. Now they’re taking things in a different direction with their new CGI film Grimalkin. 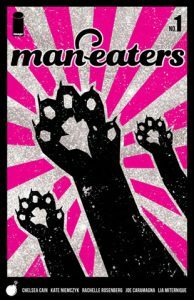 According to an article in Variety, “…the horror comedy narrates how a domestic cat’s love for his family is tested when mischievous creatures invade the house, a foster home run by a loving young couple. 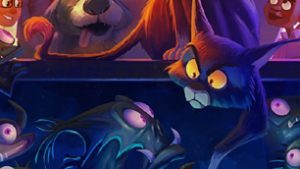 Being the only one with the ability to see them, the cat must confront the creatures before they take over the house and its inhabitants.” The film is being directed by storyboard artist Sant Arellano. There’s no word yet on a planned release date — but check under your bed just in case. Back to Halloween, it seems — and back to more strange new twists on old friendly characters. This time, it’s Archie and the Riverdale gang — in a new horror comic called Jughead: The Hunger. Yes. “Jughead Jones is an average (though endlessly hungry) teenage boy by day and a blood-thirsty werewolf by night. His latest victim in a spree of deadly attacks is longtime foe Reggie Mantle – after which Jughead left Riverdale without a trace. Now Betty Cooper: Werewolf Hunter and Jughead’s best friend Archie Andrews are hot on Jughead’s trail, but how many more lives will be sacrificed before they find him? 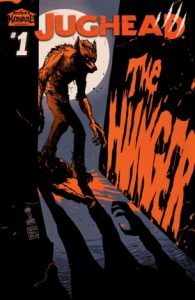 On October 25th, join writer Frank Tieri (Wolverine) and artists Pat and Tim Kennedy (Death of Archie) for the terrifying first issue of the new Jughead: The Hunger series!” There’s an extensive review over at The Nerdist.